First and foremost, the biggest selling point for me on Dropkick was the sync functionality. I’ve been a big user of Things on all platforms and I can’t tell you how good it feels to finally not have to sit by my computer to sync my tasks. With Dropkick you just hit the refresh button and everything gets synced over the air. The app does not use WiFi, so you can be anywhere and get access to your latest tasks and to do lists. You sign up for a DropKick account with an email address and password. Once you’ve done that you just need to enter that information into another Dropkick app and all your lists get pulled in for you. Second part about Dropkick that I like is its simplicity. Now this might be just a result of the app being new, but there isn’t very much to fiddle around with. The Mac app and the iPad app are a simple two pane window which are pretty much identical in design and functionality. On the iPhone you just have one pane at a time. You just have lists and tasks which you can complete. That’s all! 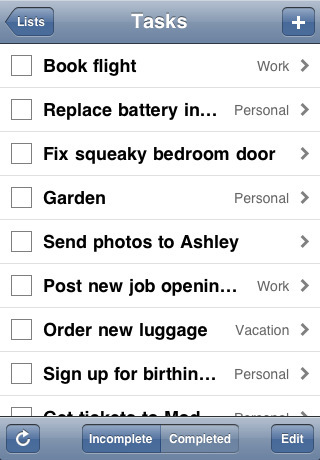 Create a list, add tasks to it, and check them off when you’re done. 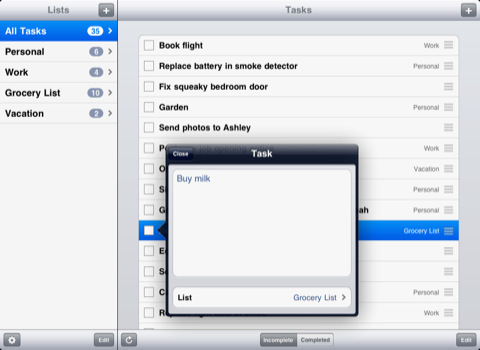 You can move tasks between lists and drag tasks to rearrange their order but that’s as complex as it gets. On the Mac app you can use the keyboard to move around and create new tasks, hid the list view, and filter incomplete or completed tasks. There are no sub-lists but you can just enter a tab to make tasks appear that way in the view. On the iPhone and iPad you can change the font size from small, to medium, large and extra large. Now if you’re a GTD heavyweight and I am, you might want repeating tasks, due dates, tags, projects, scheduled tasks and more, but Dropkick doesn’t give you that. Although once you start using this app you’ll find that without all the fuss you actually spend more time doing your tasks and less time making and maintaining lists. A few suggestions for improvements. In all versions of the app: A color setting would be nice to have for various tasks or lists. It would be nice to be a able to mark all items from a list either complete or incomplete. This would help with doing the same tasks repeatedly. 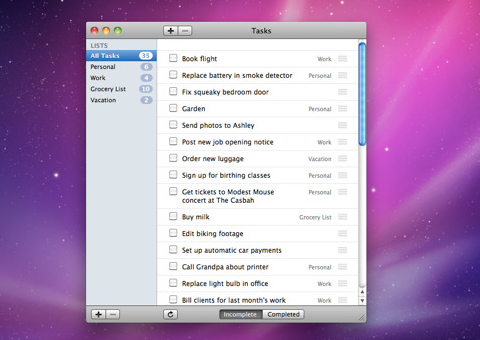 In the Mac version of the App: I like that I can use the ⌘N combo to create new tasks. It would be nice if the escape key would undo what I just did, to make life simpler. Clicking on a task should just select it, instead of letting me edit it so I can quickly move tasks around or delete them. Perhaps having that as a preference? I would love to have the app sit in the menubar and have a list view drop-down if at all possible, similar to how CalendarBar works. Pricing is not exactly clear so here’s how it works. The apps are free to download, but you’ll have to pay for them after you hit a maximum number of tasks 10 tasks each time you use the app. Here’s the pricing structure for Dropkick which basically means you’ll need to pay $12 to use all the apps together. Overall, I would really recommend you try these apps out and decide for yourself. I for one am going to start using Dropkick for at least some time, until the new Reminders app from Apple comes out with iOS 5 in the Fall. AppSafari review of Dropkick was written by Joe Seifi on June 18th, 2011 and categorized under App Store, Free, iPad apps, Notes, Productivity. Page viewed 4825 times, 2 so far today. Need help on using these apps? Please read the Help Page.